Tension is high after fighting between soldiers from the Karen National Union and the New Mon State Party in Ye Township the last weekend. It adds to government concerns as both ethnic armies are signatories to the National Ceasefire Agreement. 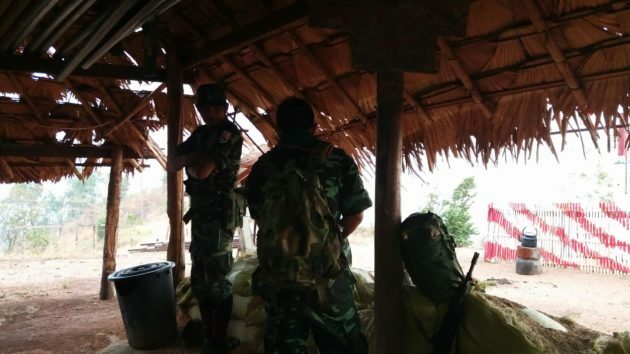 The fighting took place on February 24 near Man-aung village in Win Ye Township between troops from the KNU’s armed wing, the Karen National Liberation Army’s 16th Battalion under Brigade 6 command and NMSP troops from its 7th Battalion. Karen News is led to understand that the clash was due to illegal logging and a territorial dispute. Nai Win Hla, head of the NMSP’s internal affairs department, in an earlier interview told Karen News that the clash was linked to illegal logging. “There was an illegal logging issue in the past. [The clash] took place due to the continuation of illegal logging,” Nai Win Hla said. Captain Bo Bo Tun accused the NMSP of taking two arms belonging to the KNLA during the clash. Sources close to the KNLA based in the area said that both sides of local leaders met on February 26 to try to solve the problem by peaceful means. Karen News understands local Burma Army officers took part in the discussions between the two warring sides. KNLA sources said some specific agreements on the latest conflict were reached during the meeting, including the return of arms to the KNU. Despite agreements reached on previous clashes, there are concerns further armed disputes will continue if the situation remains as it is. Both the KNU and NMSP have signed the government’s Nationwide Ceasefire Agreement (NCA). The NMSP signed the NCA recently, while the KNU has been a NCA signatory since the NCA was initially signed in October 2015. Both armed organizations have overlapping territories that have caused armed conflict in the past.